Deep Purple takes a slightly heavier turn on their sophomore release. 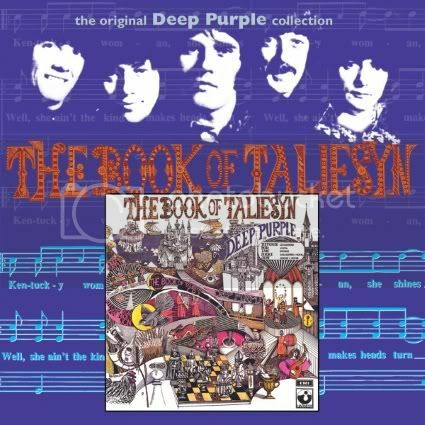 After Deep Purple's success with Shades Of Deep Purple, the band did not stray far from its formula for their second album The Book Of Taliesyn. Like its predecessor, The Book Of Taliesyn is roughly half cover songs and half originals and it is being rereleased on CD along with all of the other Mk. I albums with a number of bonus tracks. Book sees the band adding a harder edge to their sound, one they would expand upon with later lineups of the group. The album opens with "Listen, Learn, Read On," a driving song with killer drumming by Ian Paice. The band wasn't fully out of psychedelic territory yet however as the song has trippy, echo-laden spoken word verses. Many years later, the song's title also served as the name of a rarities box set. Up next is the instrumental, "Wring That Neck." With its tandem guitar and organ lines, the song has remained a fan favorite and one the band still trots out live on occasion. Their cover of Neil Diamond's "Kentucky Woman" was not as successful as "Hush" had been, but still managed to crack the top 40. The song is heavier than Diamond's original and the guitar riff borrows heavily from Mitch Ryder. The Ike and Tina Turner classic, "River Deep, Mountain High," is reworked here into a 10-minute psychedelic epic that includes a lengthy organ intro from Jon Lord that quotes "Also sprach Zarathustra" (2001 was a new movie at the time) and shows Lord's interest in mixing classical with rock music. Along those lines, "Anthem," a pretty ballad with great vocal harmonies includes a lengthy orchestral part in the middle of the song. Bonus tracks include the studio outtake "Oh No No No," a strong track co-written by Mike Leander and Leon Russell and a sizzling live take on "Wring That Neck" from the BBC. While not as successful commercially as Shades Of Deep Purple, The Book Of Taliesyn showed the band making great strides artistically — a trend that would continue well past the departures of singer Rod Evans and bassist Nick Simper. Book is a worthwhile listen for fans of Deep Purple in its earliest incarnation and proves the band was not to have a sophomore slump.